Browse Frames From the Comfort of Home! If you’ve ever felt like you didn’t have enough time to properly browse for glasses after your eye exam, you aren’t alone! We understand that you have a busy schedule and that it can be tough to give your frames search the full time and attention it deserves. That’s why we’re so excited to announce our new online frames gallery! Now you can look through the different frames we offer at your own pace, any time, from the comfort of home. 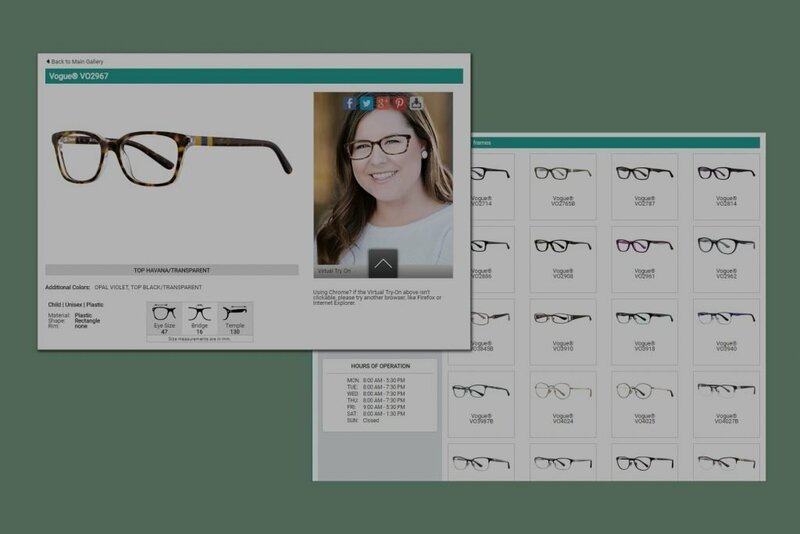 Use this tool to help determine which frames suit your personal style and narrow down which frames you’d like to try on in person. While you’re browsing, you can sort by designer, style, material, color, and more, to narrow down your search if you already know the type of frames you’re looking for, or browse through all available frames to see what piques your interest. For example, if you already know you’re looking for black frames, but aren’t sure if you want to go with metal or plastic frames, just set the color option and then see everything we have in black. There are a ton of filtering options, so play around! If you already have a pair of frames that have worked well for you, you can use the size of those frames to help you zero in on other complimentary sizes. All of the frames listed in the gallery will include 3 frame measurements—the width of the lenses, the width of the bridge of the nose piece, and the length of the temple arms. You’ll find your frame measurements printed on the inside arm of your frames. For example, if your frames say 52 – 18 – 130, your lens width is 52 mm, your bridge is 18 mm, and your temple arms are 130 mm. As a general rule of thumb, you should stick within +/- 2 or 3 mm of the frame measurements that have worked well for you in the past. 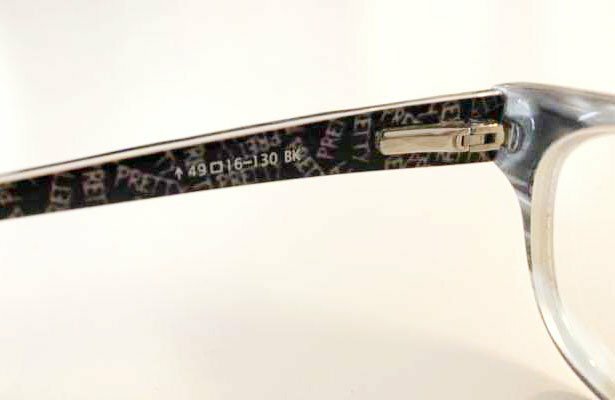 If you can’t find your measurements printed on your glasses, you can measure each dimension with a ruler using millimeters, or if you bought your last pair from us, reach out and we can help you out with the measurements. If you’re a first-time glasses wearer, don’t worry! You can use My Frames Gallery to get started picking out the styles and colors that appeal to you, and then one of our opticians will help you get set up with the correctly sized frames. The lens, bridge, and temple arm measurements found on the arm of a pair of frames. 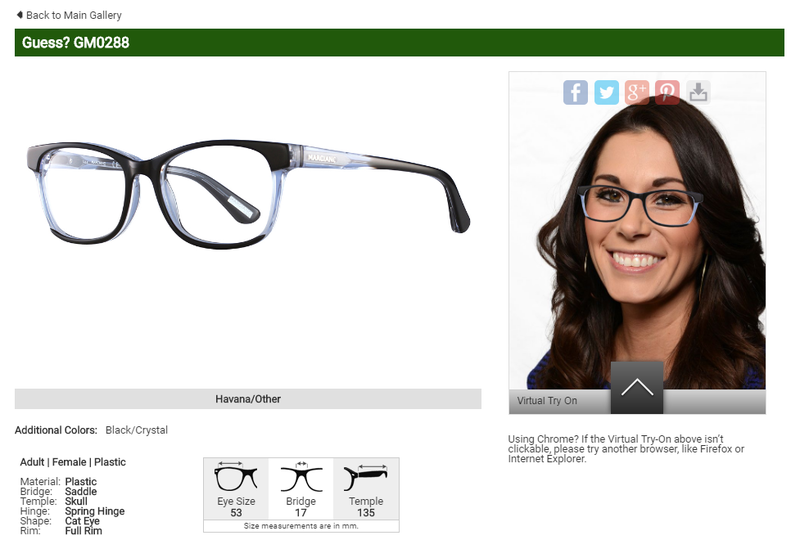 You’ll also have the option to “try on” some frame styles digitally. Just upload a front-facing photo of yourself glasses-free, and then the frames will load on top of your photo so you can see how the color and shape of the frames compliment your face. There are even share and download options so you can send different frame options to friends and family to get their input. Keep a list of the frame brands and style names you’d like to test out in person when you order your glasses. And if you didn’t find any winners online, no worries—we have even more options in-store and our opticians are happy to help you narrow in on the right pair. Remember that you can shop for glasses in our optical center any time, no appointment needed. So click the link below to get started shopping for your next pair of frames!